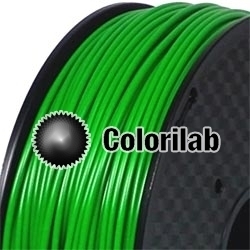 This Nylon (PA) 3D printer filament 2.85 mm dark green 2272C offers mechanical properties in the same vein as the POM (acetal) polymer. Nylon (PA) 3D printer filament is impact resistant, has a low coefficient of friction and good durability against abrasion. However, nylon (PA) 3D printer filament absorbs ambient moisture readily, which reduces the performance of its mechanical properties. Nylon can be used from -80°C to 120°C.